Discussion in 'National Politics' started by bharathp, Jul 26, 2017. Nitish Kumar has quit as Chief Minister of Bihar, ending the two-year-long political experiment that was branded as a game-changing Maha-gathbandhan or Grand Alliance which included his party, Lalu Yadav and the Congress. This evening, Mr Kumar met with Bihar Governor Keshari Nath Tripathi to deliver his resignation. His stunning move came after Lalu Yadav reiterated earlier today that his son, Tejashwi, would not quit as No 2 in the government despite being caught in a corruption scandal. Nitish Kumar then met with law-makers from his party, the Janata Dal United or JDU, and told them that he would return from the Governor's home to inform them of what lies ahead. A new political arrangement, most likely. The opposition BJP had said weeks ago that it is willing to lend external support to keep Nitish Kumar in office without participating in his government. Through the day, events pointed to a climax of the political drama that has raged in Bihar for weeks. The Governor reportedly changed his travel plans to stay back for the meeting requested by the Chief Minister. Lalu Yadav, due to fly to Ranchi for a court appearance tomorrow, decided to drive there instead of flying, which allowed him to remain in Patna for a few extra hours at a crucial time. On July 7, Lalu and Tejashwi Yadav were named in a corruption case by the CBI which searched their Patna home. The Yadavs have attributed the case to a get-even attempt by Prime Minister Narendra Modi who they allege is "scared" of their concerted opposition to him. Nitish Kumar said the defense didn't wash, stressed that his "zero-tolerance to corruption" policy is unwavering, and amply hinted that Tejashwi Yadav should rise to the occasion by opting out of the government. Today, Lalu Yadav's party met and repeated that not only will Tejashwi Yadav remain in office, but that the Chief Minister's suggestion of a public and detailed defense has not been accepted. "I have known Nitish for 40 years, he is no saint," said Shivanand Tiwari, a senior member of Lalu Yadav's party. "We can't compromise on Nitish's clean image," said KC Tyagi, a senior leader from the Chief Minister's party. The sudden death of the Bihar alliance will considerably wind the attempt of the opposition to build an 18-party front that hopes to prevent Prime Minister Narendra Modi from winning a second term in 2019. The league was fashioned on the Bihar alliance which saw former rivals Nitish Kumar and Lalu Yadav quitting their differences in 2015 and co-signing with the Congress to ensure that their collective support groups - a range of castes - became the wall that PM Modi ran into as he led the BJP's campaign in Bihar. Wolfpack, Lion of Rajputana, SrNair and 4 others like this. Shani kee ulti chaal hai bhari, aaj Bihar toh kal Dilli kee baari. zebra7, Wolfpack, Lion of Rajputana and 4 others like this. Wolfpack, SrNair, Kalmuahlaunda and 4 others like this. Modi has Openly Supporting Nitish Kumar. Niku's Gharwapasi! zebra7, Wolfpack, SrNair and 2 others like this. He will be back with the support of BJP's MLAs. Wolfpack, SrNair, Kalmuahlaunda and 3 others like this. GOI should attach and take over all the properties of Lalu Prasad Yadav and family. He has 600 acre land in Pune at mundhwa locals living near by claim. How come goi doesn't know this. Wolfpack, SrNair, Abingdonboy and 1 other person like this. This is that end of SP, BSP, RJD and Mamta clans from Indian Politics. Even if Bihar goes to polls, BJP will be in government. zebra7, Wolfpack, Lion of Rajputana and 3 others like this. Now Lalu attacks Nitish and blames him of compromising with the central govt. He came in the press meet today with some documents about Nitish Kumar's alleged involvement in a murder case and charges against him as per the arms act. Bihar mahagathbandhan is more or less off. Wolfpack, SrNair and Hellfire like this. With Khangraas and RJD in it, it was always the Mahathugbandhan. Wolfpack, Ironhide, Lion of Rajputana and 3 others like this. 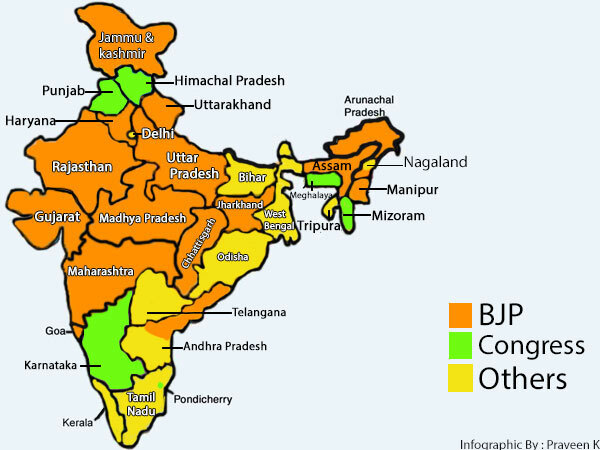 Bihar ki Ghar Vapsi and whole North is under Saffron except Punjab. Nilgiri, SrNair and vstol jockey like this. Though I wish for more drama. Like Lalu poaching 6 MLAs from JD(U) and forming a government with help of other thali ke baingans, and that government falling after few months because someone goes to jail. Wolfpack, Lion of Rajputana, SrNair and 3 others like this. Lalu clan has looted and destroyed Bihar for the last 20 years and the shameless creatures still have the audacity to come out and say "jo ukhadna hai ukhad lo hum to yahi rahenge". Wolfpack, SrNair and Abingdonboy like this. they also have wooed shankar singh vaghela out of the congress in GUj - thats a heavy weight exit that threatens the Rajya Sabha seat of Ahmad Patel (the right hand man of Sonia Gandhi). Though I wish for more drama. Like Lalu forming government by poaching 6 MLAs from JD(U) and forming a government with help of other thali ke baingans, and that government falling after few months because someone goes to jail. Its good that we are saved from all the drama. Why should people of Bihar suffer because of one or two families. Even thought they voted for Lalu and they probably deserve this but without the development of Bihar India cannot progress. Not just Lalu: Nitish Kumar also involved in fodder scam?